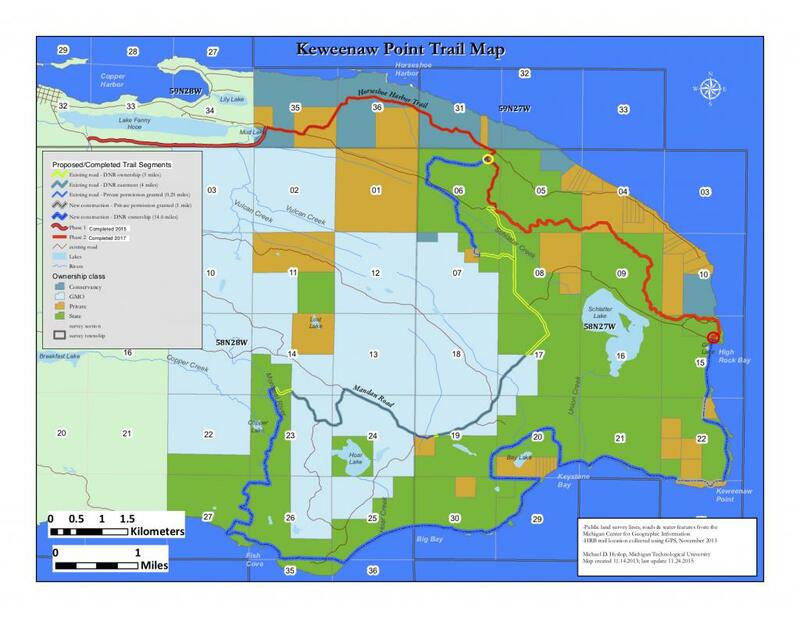 Support the Keweenaw Point Trail! Give today to help build 15+ more miles of the Keweenaw Point Trail! The Vision: an epic 30-mile purpose-built sustainable trail traversing the remote, rugged terrain at the tip of the Keweenaw Peninsula. Progress is underway but we need your help! Copper Harbor Trails Club (CHTC) working with Grant Township, MDNR, Keweenaw County, and a number of private land owners and conservancies has taken the lead to complete the proposed Keweenaw Point Trail following the recommendations of the Advisory Committee. The trails have proven to be an economic driver for the region as trail users are filling local restaurants, brewpubs, stores, hotels and the Fort Wilkins Historic State Park Campground. The effort to protect and expand the system is part of a long-range plan to connect communities and add new experiences that utilize the land and enhance access to unique assets in and around the Keweenaw region. Phase 1: Open! 2.6 miles of singletrack carved into the rocky hillside featuring occassional views of Fort Wilkins Historic State Park. The trail begins on Manganese Road just past the parking pull-off for Manganese Falls just south of town. Whereas most trails require grading soils to build a sustainable tread, Phase I required grading solid rock! This intermediate trail has a few small rock drops/ascents as it traverses the ridge over Lake Fanny Hooe. It is a bit tougher than average but is quite a lot more fun than your usual 'rocky & rooty' trail. After crossing Vulcan Creek, the trail embarks on perhaps its most impressive feature: the longest boardwalk you've ever seen! Eventually the trail pops out on Mandan Road a bit past the end of US-41. Phase 2: Open!! Beginning where Phase I left off, you'll begin your journey along Mandan Road before riding the rugged two-track out past The Nature Conservancy's Mary Macdonald Preserve at Horseshoe Harbor. After about 3 miles you'll reach the beginning of some of the most remote singletrack you'll ever ride! Phase II's 6-mile intermediate course twists and turns its way through Michigan DNR land, alternating between solid rock and dirt hard pack. The trail is best ridden west to east but maintains its fun-factor even on the return journey. Two short, skinny bridges about halfway through are about the hardest obstacles you'll face on your journey. This is a very approachable trail and fun for all levels of riding! Once you've wound your way around the deep woods the trail spits you out at High Rock Bay, the proverbial end of the Keweenaw Peninsula. A bumpy rock garden followed by a sand pit greets you at the trail's end and can be easily walked to avoid the toughest portions. Think of it as Mother Nature's way of saying "No further!" Be sure to pack a snack and your camera, because the views from High Rock Bay are some of the best around. Phase 3: On the way! – The BIG final stage will take trail enthusiasts south from High Rock Bay to Keweenaw Point, then head west to Keystone Bay and other scenic locations before reaching Montreal Falls and looping back northeast of the Montreal River. Estimated cost: $497,000. CHTC has already received support from the Recreational Trails Program ($125,000) and with the help of Grant Township has submitted a successful application to the Michigan Natural Resources Trust Fund ($297,000!) for the majority of the remaining funding need. Along with existing project funding and support from the Keweenaw Community Foundation, that leaves us with around $40,000 to raise. Will you step up to create the most epic trail around? Donate today! Read the Press Release about the Keweenaw Point Trail Phase III MNRTF award here. Current Goal: Fundraising for Phase 3! At this time we are asking for tax-deductible donations from those that love the Copper Harbor experience and want more trails extending to the furthest reaches of the Keweenaw. We are very close to our overall goal and need an additional $40,000 to make the trail happen. Please help support the construction of this awesome trail! Show your support, DONATE NOW! with your time, talents, or treasure.